If you make your living as a construction worker, farmer, miner or in any other labour intensive occupation, you’ve likely been in this situation before. Having to do back-braking work because there is no access for a machine. Fencing, hauling feed, moving dirt or rock in tight spaces can be a gruelling task. If you only had a machine that was small enough to access your job site, but strong enough to do the work. We’ve got that machine! 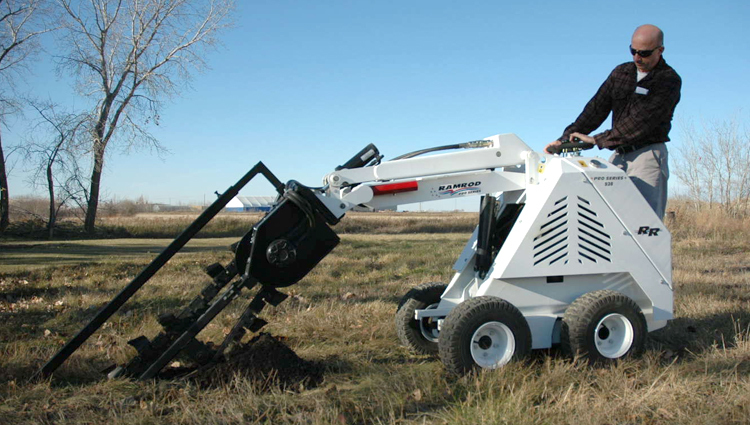 The Ramrod mini skid is one of the most compact, versatile solutions you can add to your heavy equipment fleet. Ranging in specs from the 4-wheeled 500 up to the WB1500, there is a Ramrod perfectly designed for your compact needs. Don’t waste your time doing manual, back-breaking work by hand. With a compact Ramrod mini skid, you can access the tightest job site and complete it with ease. On tracks or wheel, heavy or light, we can hook you up with the proper model and attachments. At Project Equipment Ltd., we are Manitoba’s exclusive Ramrod dealer. If you have a question about anything you read in this article, contact us for more information.